Designed and built by Fabfuel. Released for free under the BSD-3 license. 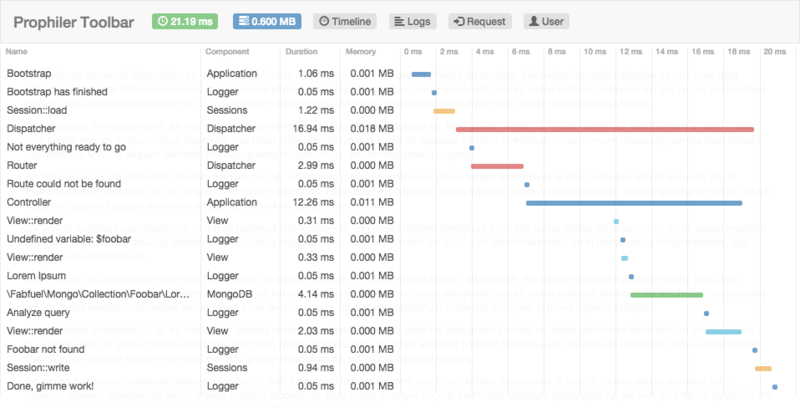 Prophiler was built to provide a powerful tool for visualizing what's going on in your PHP application. The timeline is inspired by modern browser's networking tabs and gives you a beautiful and unique overview of processes happening in the background during the run of your application. 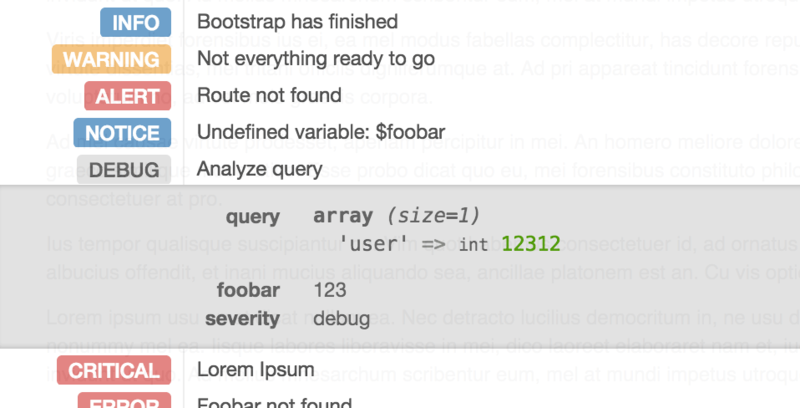 It's just the most beautiful PHP profiler out there. Inspired by modern browser's network tabs, the timeline provides a unique, detailed and beautiful overview of what's going on under the hood. With its PSR-3 compliant logger adapter, you can plug in Prophiler to your existing logging infrastructure and see all messages with a single click. 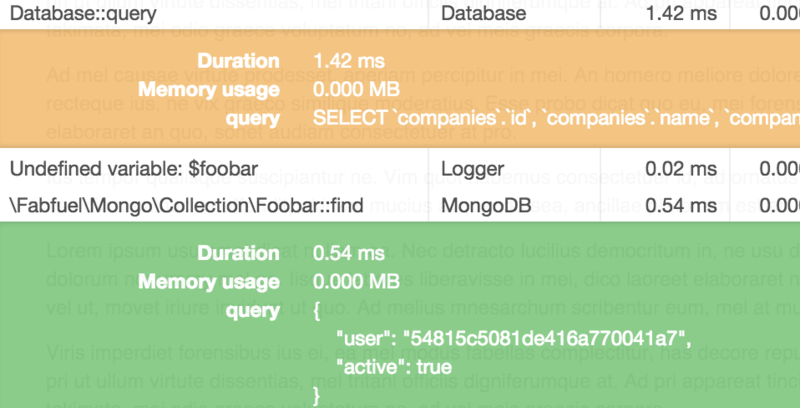 See exactly what queries and commands are processed by your MongoDB or MySQL database. In addition you get the execution time and memory consumption. Would you like to contribute to Prophiler? Benchmarks the routing and dispatching of the request to the appropriate controller action. Gives you detailed insights of how many views (and partials) were rendered, how long each needed and how much memory they consumed. If you use the Phalcon ORM or ODM, you immediately get information about all queries and commands sent to your database. Prophiler comes with some other adapters and data-collectors, for integrating easily in your application. This list is going to be continued! If you use my MongoDB document mapper, you can now easily see all database interactions (finds, inserts, updates, removes, even aggregations) in the Prophiler timeline. This data collector provides useful request information from the environment variables. You have easy access to all $_GET, $_POST, $_COOKIE and $_SERVER information.